Did you ever wonder what the rest of the world is eating to stay healthy? We’re already well acquainted with olive oil, tomatoes, and almonds from the Mediterranean lifestyle. But there’s a lot more out there! Health Plus: Fish is loaded with heart-healthy omega-3 fats and vitamin D, plus lean protein; cabbage is a cruciferous vegetable with active phytonutrients and loads of fiber. Health Plus: Daily consumption can help lower cholesterol; packed with soluble fiber; can help stabilize blood sugar. Health Plus: Good protein source; high in fiber – a one cup serving is half your daily fiber requirement. Health Plus: Fiber-rich root vegetable; loaded with antioxidants and folic acid. Health Plus: Soothes the digestive track; can reduce nausea and stomach cramps; natural breath freshener. Health Plus: Calms an upset stomach; an anti-gas food. 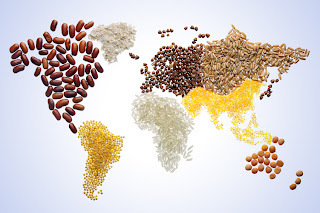 What other health foods from around the world do you enjoy? Is Obesity a Liability for Chefs?